Like other entrepreneurs before her, Lisa Williams found the inspiration for her product after perceiving a hole in the marketplace. 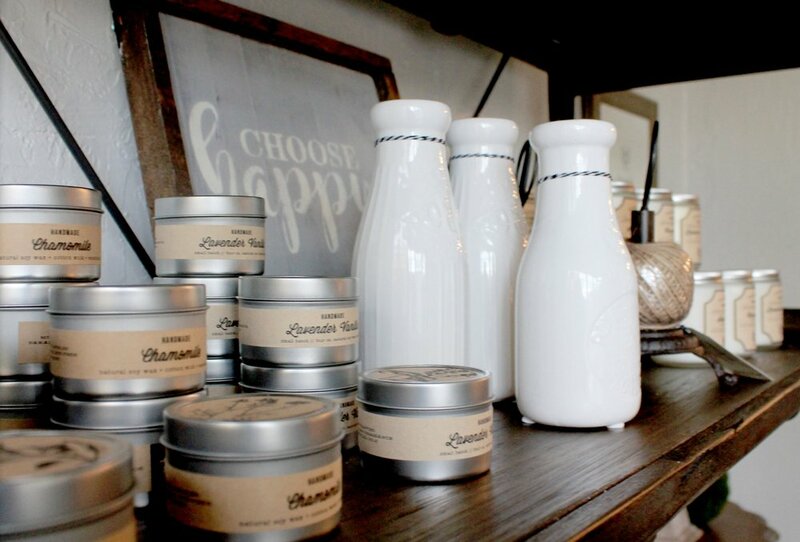 Enter Milk and Honey Candle Co., which began in 2012. Though customers can buy Williams’ products off her website, she said the company might never have taken flight if not for a partnership with Whole Foods, which opened a Wichita location in September. Today, Williams’ candles can be found in 16 retail locations in five states, including six Whole Foods Market stores. Williams is among about 40 local vendors represented on the shelves of the Wichita Whole Foods store at 13th and Webb, said Nicole Lane, a marketing specialist who works out of the Wichita store. “We are very happy to partner with our local vendors and farms,” she said. “They are like family to us. Our suppliers share the same concerns and morals for social responsibility and the environment as we do. “Plus, buying locally grown products bolsters local economies by putting that money back in the pockets of producers and growers,” she said. “We always try to connect with local producers when we enter a new market.” Whole Foods also offers low-interest loans to small producers for capital expenditures, Lane said. Another hit at Whole Foods locations has been Michael McCoy’s Real Deal Salsa. A Bel Aire resident and El Dorado native, McCoy said Whole Foods hasn’t been able to keep the salsa on its shelves because of its popularity. Like Williams, McCoy – who also operates the Real Deal Cafe in El Dorado – is looking to take his product to the next level. McCoy, who also sells a line of Real Deal meat seasonings, has his products at Dillons locations in addition to Whole Foods. After tweaking his salsa recipe during the past several years – he found that adding salt is rarely a poor decision – McCoy, with the help and expertise of his wife, Jennifer, settled on a formula and now has his salsa made by co-packer Original Juan in Kansas City, Kan.
Another local vendor who has had success with Whole Foods is Andrew Gough of Reverie Coffee Roasters, who said he has been told his company’s products have at times been among the best-selling coffee brands at the store. Because of its list of strict standards – Whole Foods does not sell products that feature artificial food coloring or have high-fructose corn syrup – the process might be more difficult for producers to get their products in the door, at least compared with some other retailers. Still, the consensus seems to be that the natural foods and products chain can offer potentially fruitful partnerships for entrepreneurs, especially for those attempting to get started. Whole Foods, founded in 1980, has more than 400 stores in North America and Europe. The store typically hosts local vendors on the second Saturday of every month for a taste fair where consumers can test products and speak with producers. Just last week, I purchased a Hyacinth plant to usher in fresh life into our home. The strong floral fragrance was so fresh and clean. It inspired me to freshen up things around the shop. New pieces of distressed painted furniture, garden home decor and vintage accents filled our little shop. It's funny how little things like this inspire us to do more. Even though winter is still here, I was eager to decorate the shop with ferns, mint green, seaside blue and tiny touch of florals. Its beginning to feel like spring at Milk + Honey. It's been practically a year since my last blog entry. I had all these aspirations to become a blogger but little time to invest. As you can imagine, I have been busy making candles. But honestly, where did the time go? It just flies out the door when your having fun, I guess. Business has really taken off and I almost don't know where to start to fill you in on what's happened. I have been good at keeping up with my Facebook page. But in case you haven't followed that, I will start with our most recent venture, Relove All Things Shabby. Relove All Things Shabby is a shop of vintage goods, painted furniture and home decor here in Wichita, KS. Rhonda Gribble and Stacy McCarthy started their venture together and have been refurbishing old furniture for years. Coupled with their talent for painting, they also a retailer of Plaster Paint. With much success they decided to expand their shop into a larger facility and invite artisans, craftsman and antique dealers to create a venue called Relove Market. Pictured is my candle booth and all its charming vintage decor from the past fall season. Of course, I couldn't help myself, I hand to get my hands into painting furniture. You will see more pieces in the near future. In November, Courtney Browning of 12th and White joined our shop. It's a great fit and I adore her style. You have got to visit her blog too. Courtney is so talented and her home decor is absolutely beautiful. We both love architectural salvage and she has a passion for antique home decor (ironstone, antique tin and rustic windows). We have charming farmhouse & cottage accents to fill your cozy home. Check back with us as I will soon reveal our expansion. I'll have lots more painted furniture and Christmas decor to share with you. Happy Holidays!